For every business operating online the choice of a web analytics solution is a crucial one. In selecting a web analytics you need to take its accuracy, reliability, and costs into account. The wide variety of available web analytics solutions does not help you solve this dilemma, either. In this blog post we want to help you discern whether or not you should go for a self- or cloud-hosted web analytics solution. Once you get this sorted, you will be able to focus on looking for the right web analytics provider to link up with. usually claim the rights to the data you collect, which means you can fall short of complying with international privacy regulations that are becoming more and more rigid. (According to the new European Data Privacy Regulation, just one instance of infringing the law can cost you as much as 4% of your annual revenue). Surely this is another very tangible reason why you cannot afford to compromise on privacy, especially if your organization handles sensitive data on a daily basis. 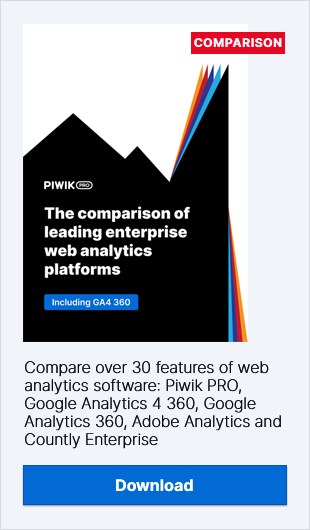 Mind you, Piwik PRO Cloud is an exception on the market – regardless of the version of this web analytics tool you use, you retain full ownership of the data. To learn more about privacy liabilities, read our blog post on how they change depending on different software delivery models. don’t guarantee processing sensitive data – some cloud web analytics tools, like Google, forbid you from uploading personally identifiable information (PII) – they will not meet the needs of healthcare or financial institutions. are proprietary, which means they usually offer a limited number of customizations. If you are a large organisation with a more complex business model, you need a bespoke product. The open API of self-hosted solutions allows you to have a product that caters for your unique needs, without asking you to compromise. come with a cap on the volume of data you process – if you process a larger amount of data than your tariff accounts for, the tool is likely to switch over to data sampling, which large organizations simply cannot rely on. All in all, it’s pretty clear that if you are a large enterprise or a government organization, there are better options for you on the market – you should scout for a robust on-promises tool. However, as we know, every cloud has a silver lining, and in this SaaS web analytics is no different. Let’s have a quick look at the positive aspects of clouds, which cannot be denied. affordable – very often they are free, and if there is a charge, the fee is much lower than what you would pay purchasing an on-premises solution. You also save on the labour hours as cloud solutions are off-the-shelf and ready to be implemented upon purchase. This means you can do without the IT resources you would normally need when using your own on-premises tool with backups, updates, monitoring, and upgrades. Fast and scalable – cloud solutions are faster and more agile than on-premises ones. They are also scalable, at least to a certain extent. Mind the limitations, though, as when you exceed them you run the risk of data sampling. Convenient – they are easily accessible from anywhere you are. Plus, you do not have to worry about maintaining all the infrastructure like servers and databases on you own, as cloud services providers do it for you. Therefore, if you are from a small- or medium-sized organization, SaaS implementations of web analytics should be just the job for you. First of all, it will spare you a great deal of costs, and if you choose wisely you will find a solution that caters perfectly to your needs. That said, be wary of the data ownership aspect and the risks of data sampling. If you are an institution which handles sensitive data, then for security reasons you should definitely narrow your search down to self-hosted web analytics solutions. You should also consider buying a self-hosted solution even if the issue of handling sensitive data does not apply to you, but given your business model you think you would profit more from using a bespoke solution. They are bound to deliver the data and the reporting you require. If you are neither large nor involved in government activities, go for a cloud solution that respects your rights to the data you collect, or at least has clear Terms and Conditions so that you know beyond a doubt that the data you collect is not going to leak to your competition or other third party. We hope you’ve found this blog post helpful. If you happen to consider using Piwik PRO, whether on-premises or cloud, get in touch. We’re ready and waiting to answer your questions!